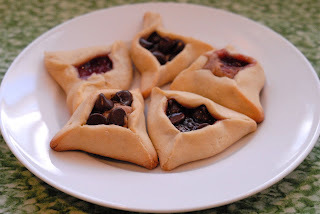 In honor of Purim this week, here is a picture of the hamantaschen I made three years ago. I would like to tell you what flavors they were, but I can't be sure. The ones in the front are apricot/chocolate chip and raspberry/chocolate chip. The others are probably cherry and I don't know what else. I have a love-hate relationship with hamantaschen. They are one thing I really don't like to bake myself because I never can decide if I want a yeasted dough or a sugar cookie dough. I have tried several recipes of both and never liked any of them. That said, I do enjoy a good hamantaschen made by someone else, particularly if it's got a good filling-to-cookie ratio, so feel free to send one my way!